Bulwer Zetford’s work-in-progress The Cosmic Messenger is about to take a strange turn, and the multiverse with it, when Roithamer of Relix “beads” once again and brings swirling into Zetford’s Kaduza M-mon processor the Encyclopedia Mouse, the one creature who can save the multiverse. Tale twines tale as the mouse battles his Doppelgänger in cyberspace, Heidegger in his Black Forest hut, and a hyper-crazed Roithamer. Death is everywhere, but the mouse, birling (if only barely) in his Binding Nexus Drive, is determined to narrate the universes away from their demise. Dive into August with a stunning work of speculative metafiction. This is seminal post-cyberpunk with wicked Oulipian twists, crafted by a master of innovative fiction. 6” x 9”, trade paperback original. 172 pp. TOM WHALEN is a novelist, short story writer, poet and critic who has written for Agni, Asymptote, Bookforum, Chicago Review, Fiction International, Film Quarterly, the Washington Post and other publications. His books include Dolls, Elongated Figures, The Birth of Death and Other Comedies: The Novels of Russell H. Greenan, and the novels Roithamer’s Universe and The President in Her Towers, which John Warner in the Chicago Tribune called a “mash-up of Kingsley Amis and Italo Calvino. 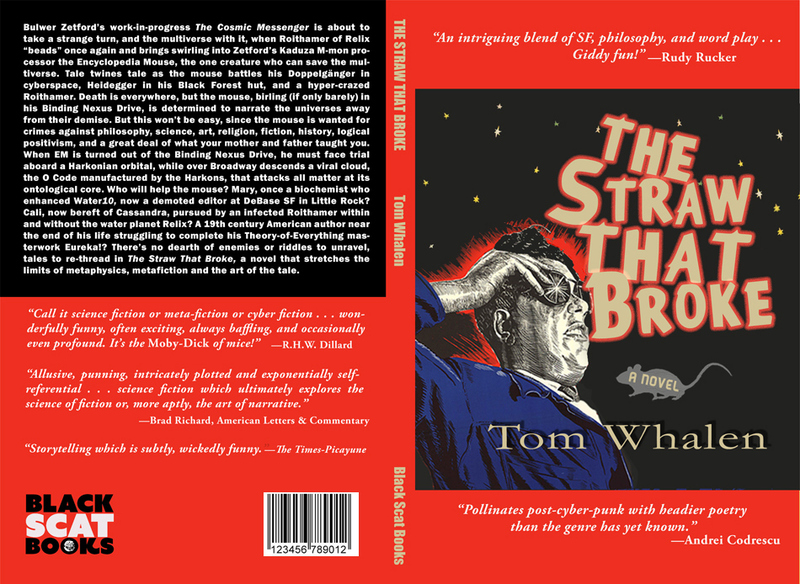 A strange, surreal and wonderful novel.” Whalen currently lives in Stuttgart, Germany, where he teaches film at the State Academy of Art and Design. Posted in: book launch, Event, Fiction, metafiction, News, novel, sf | Tagged: Andrei Codrescu, animal rights, book, Brad Richard, cyber-punk, fiction, novel, R.H.W. Dillard, Rudy Rucker, SF, Tom Whalen.